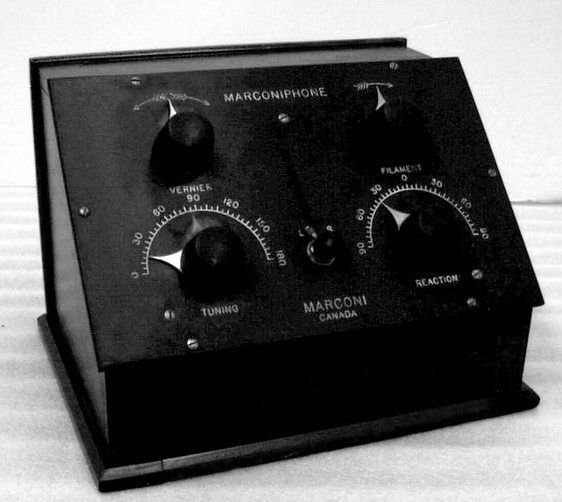 The earliest Canadian Marconi receivers were given ascending Roman numeral model designators. These Roman numerals are also referenced here along with their corresponding Arabic numbers. The very first receiver in the Marconiphone series did not bear any model designator other than Marconiphone. 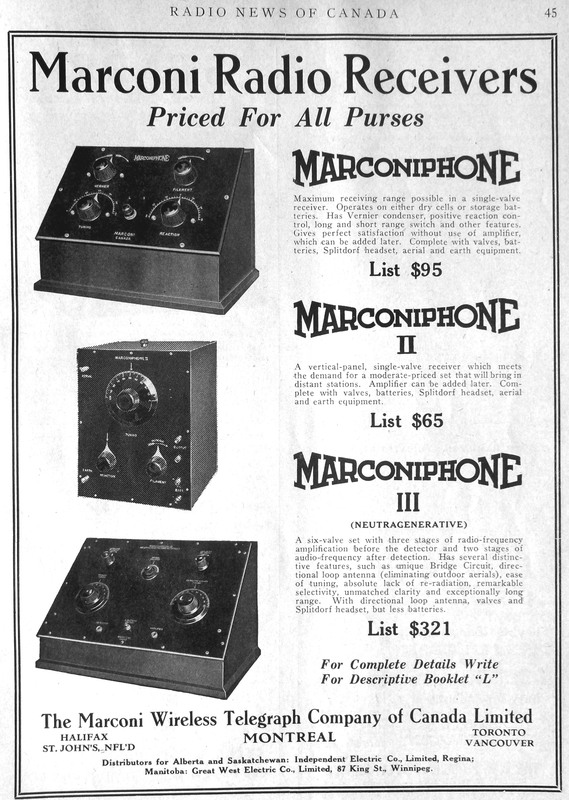 This ad, from May 1924, shows the early Marconiphone model number progressions . The numeric 1 (one) was added to the model selection table for purposes of clarification. Circa: Introduced May 1922 as per the date on the schematic. Tube Lineup : The receiver employed one 201A tube and the audio amplifier had two of them. Cabinet style: Tabletop. in a solid mahogany cabonet. 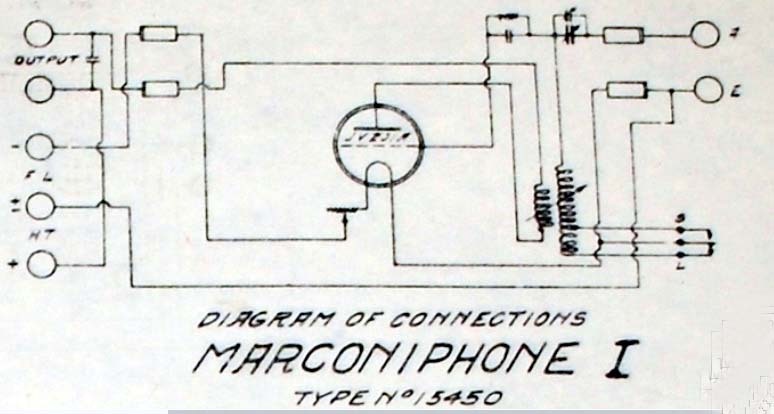 "MARCONIPHONE" and "MARCONI/ CANADA" printed on receiver control panel. All controls, connections, etc. labelled. Silver metal fixed to inside of cabinet door incised "THE MARCONI/ WIRELESS TELEGRAPH CO./ OF CANADA LIMITED/ MONTREAL/ PATENTED 1918-1923/ TYPE NO. M1 SERIAL NO. 816". "131" stamped into lower rear inside edge of cabinet. "MARCONI/ CANADA" incised in receptacle for vacuum tube. Internal component located between coupler & tuning coil marked "HOLD-TITE/ CARTER RADIO CO./ CHICAGO". Vacuum tube marked"CANADIAN/ WESTINGHOUSE/ 201 A" on tube top. This description came from the Museum of Science and Technology in Ottawa.